From Pulitzer Prize-winning New York Times columnist Dan Barry comes the beautifully recounted story of the longest game in baseball history—a tale celebrating not only the robust intensity of baseball, but the aspirational ideal epitomized by the hard-fighting players of the minor leagues. 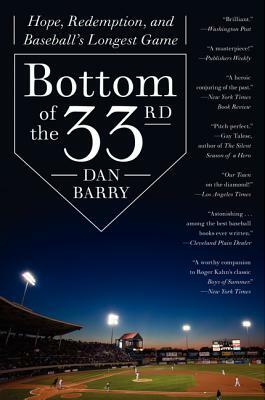 In the tradition of Moneyball, The Last Hero, and Wicked Good Year, Barry’s Bottom of the 33rd is a reaffirming story of the American Dream finding its greatest expression in timeless contests of the Great American Pastime. Dan Barry is a reporter and columnist for the New York Times. In 1994 he was part of an investigative team at the Providence Journal that won the Pulitzer Prize for a series of articles on Rhode Island’s justice system. He is the author of a memoir, a collection of his About New York columns, and Bottom of the 33rd, for which he won the 2012 PEN/ESPN Award for Literary Sports Writing. He lives with his wife and two daughters in Maplewood, New Jersey. Dan Barry has crafted a loving and lyrical tribute to a time and a place when you stayed until the final out...because that’s what we did in America. Bottom of the 33rd is chaw-chewing, sunflower-spitting, pine tar proof that too much baseball is never enough.